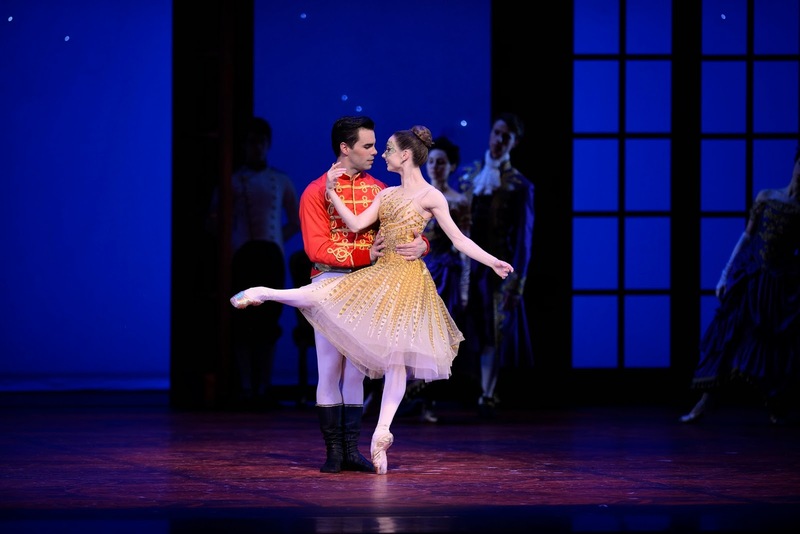 Last year, audiences flocked to the War Memorial Opera House for Christopher Wheeldon’s brand new, re-imagined version of the narrative classic “Cinderella”. San Francisco Ballet’s final program of 2013 played to sold-out houses; what a way to close a season. After such an ebullient (and well-deserved) reception, it makes sense that this full-length story ballet has re-appeared in the repertory line-up for 2014. Dance critics see repeat performances all the time; reviewing the same ballet goes with the territory. Part of live dance’s beauty is its impermanent, fleeting nature – as such, no two performances (even of the same ballet) are ever identical. And especially when a ballet’s casting is entirely different than a previous viewing, there is plenty to say. With the exception of Shannon Rugani’s unforgettable Hortensia (which was a joy to see again), the dancers in all of “Cinderella’s” main roles were new this time around (to me). Maria Kochetkova and Joan Boada in Wheeldon's "Cinderella"
Wheeldon’s “Cinderella” certainly calls for technical excellence but even more so, it demands and requires a deep artistic sensibility. To successfully pull off each role, every cast member must be both a brilliant dancer and an equally convincing actor. San Francisco Ballet delivered like never before. Maria Kochetkova was a consummate Cinderella, dancing all three acts with an authentic youthfulness. While keeping that innocence consistent, she injected each variation with a different flavor – her first, a sense of sorrow and loneliness; the initial duet with a disguised Prince Guillaume (Joan Boada), careful and humorous; the ballroom scene, light and free. In this last example, Kochetkova floated through space, free of all burdens, especially in her circular turning sequence. In Act III, as Cinderella remembered the ball, choreographic snippets and motifs recurred. She was not reliving those moments in sadness or despair, rather in hope and joy of inclusion. Wheeldon’s choreography for Cinderella and the Prince’s final pas de deux also carried a hopeful nature, but it had much more of a forward feel. Effortless lifts and circular spins pointed the young couple toward their future. Prince Guillaume could not have been cast better; Boada was perfection. He soared through every jump; his jetés en tournant, particularly regal. But one of the highlights of the whole production was the camaraderie between Boada and Taras Domitro (as his confidant Benjamin). In every interaction, their friendship was palpable and honest; a true lifetime connection. Though maybe not the point of the ballet as a whole, it was just really beautiful. Both stepsisters (Sasha De Sola as Edwina and Frances Chung as Clementine) were appropriately petty, silly and artificial. And though Act II slows a little too much in the middle, De Sola’s featured dance in that section also contained some of her best acting ever. The most visually stunning scene in Wheeldon’s “Cinderella” is the seasons, or spirits, as he calls them. Mystical and otherworldly, each of these four sequences highlights Wheeldon’s unique choreographic talent - his ability to blend classical technique with unexpected contemporary twists knows no bounds. ‘Spring’ celebrated footwork with light staccato fare. Summer brought maturity with long lines, sweeping legs and Jaime Garcia Castilla’s slow, controlled pirouettes. Led by Hansuke Yamamoto, Autumn spoke of drama and dynamism with large jumps and directional shifts. Finally, winter injected a sense of constant motion.